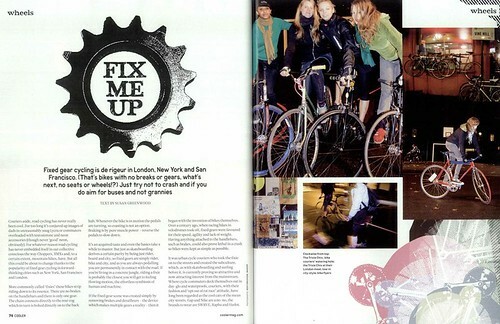 The Trixie Chix feature in this months’s Cooler Magazine article on fixed gear bikes. 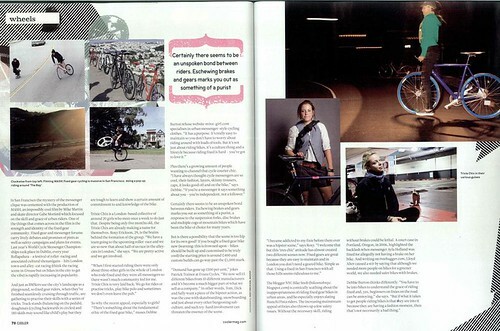 Yes, the journalist does lazily harp on about riding with no breaks (sic), right next to a picture of bikes with brakes, but it’s great to see an article in a women’s magazine about cycling! Rather than your usual crap about how to put on eyeliner. I mean, I love eyeliner, but I don’t want to read about it; I just want to wear it. For those of you who don’t know the Trixie Chix, are a bunch of women who ride bikes (primarily fixed gear) and goof around learning tricks and playing polo. We meet every week near Brick Lane to do exactly that. 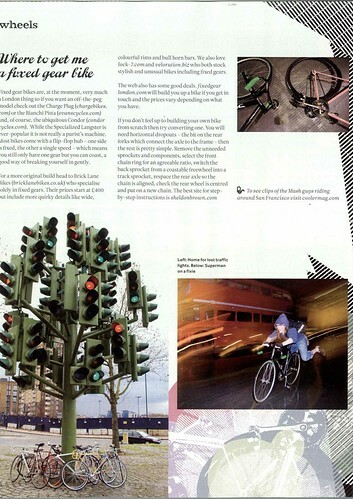 We do all sorts of other bike related things too, including alleycats (not me personally), roller races (I try but I’m terrible), social rides, charity rides etc. You’ll see more of us soon as we’re featured in Elle Quebec in August and in Sunday Times Style in June.